Amazon Blackberry Key2 Quiz Answers: Plan & Win, Amazon has again come up with app only quiz time. 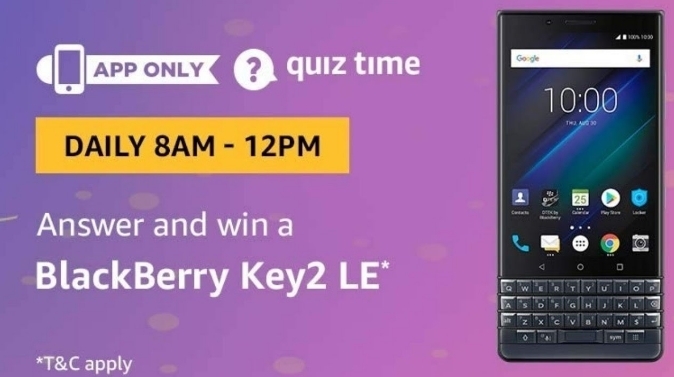 In this Quiztime you can win Blackberry Key2 phone absolutely free. This Quiz is valid only for today from 13th January 2019 8:00 Am to 12:00PM. So open your Amazon app and play this quiz. Offer is applicable from 13th January 2019 8:00 Am to 13th January 2019 11:59 Pm. 1. British women over the age of 30 who met minimum property qualifications could do what from Feb 1918? 2. Which famous scientist wrote the book ‘A Brief History of Time’? 3. As of 1st January 2019, which of these countries has officially quit the UNESCO? 4. Which element is represented by the chemical symbol Fe? 5. Which of these is an initiative recently launched by ISRO to engage students with space science activities?